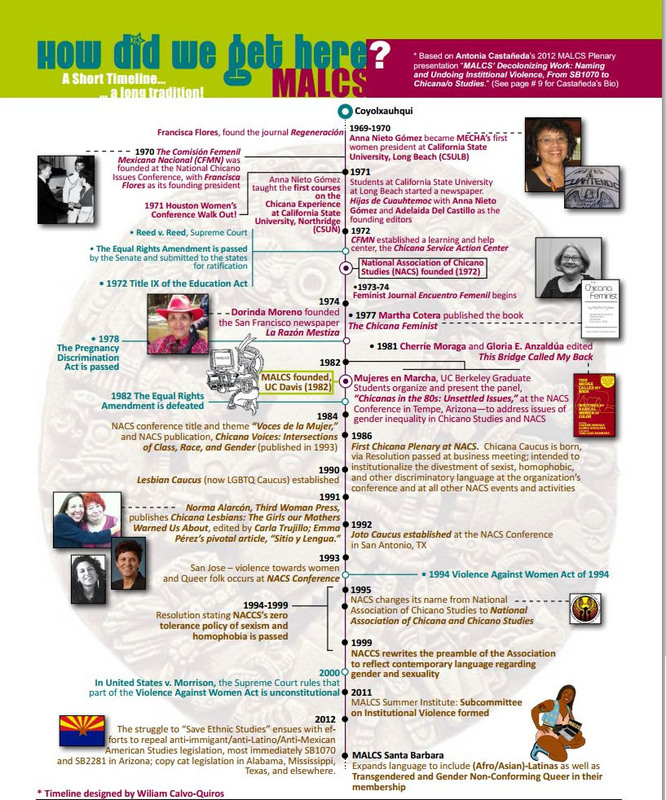 Timeline graphic reprinted from News from Nepantla, UCSB Chicano Studies Newsletter, Fall 2011, No. 5. Thank you to Aida Hurtado, Jessica Lopez Lyman, and William Calvo-Quiros. Cecilia Burciaga wrote a proposal for a National Chicana Foundation in Washington D.C.
Antonia Castañeda (Stanford) and Ada Sosa Riddell (UC Davis) discussed the lack of Chicana courses. UC Davis organized the “Chicana Lecture Series” in honor of Magdalena Mora with nine speakers. Chicana Academic issues Conference, Part 1 held at UC Davis, attended by eight undergraduates, nine graduate students, one staff member, and six professors. Declaración de MALCS is written. Chicana Academic Issues Conference – Part II held. MALCS meetings began on a formal basis. UC Davis produced the first MALCS newsletter. Discussion of a research institute began. 150 persons subscribed to MALCS newsletter. Trabajos Monograficos, the MALCS working paper series began. The editorial board consisted of Antonia Castañeda, Alma Garcia, Clara Lomas, Adaljiza Sosa Riddell and Lenora Timm. Workshop/meeting held in Pomona to write a proposal for a research center and the first Chicana/Latina Summer Institute. A 17 page+ document was produced. First MALCS Summer Research Institute held at UC Davis. Representatives from Mexico attended. Emma Perez wrote summary of the event for La Red. First printed by­laws of MALCS made available to members. 2nd MALCS institute at UC Davis. Theme: Ethics. Dolores Huerta, Ana Nieto Gomez, and Cherrie Moraga were plenary speakers. Constitution revised. Ideological debate over the goals and objectives of MALCS. Women’s Unit, Chicano Studies Research Center sponsored the First MALCS organizational meeting in Southern California at Pomona. Yolanda Lopez developed the MALCS logo. 3rd MALCS institute at UC Davis. Theme: Beyond Stereotypes. Deena Gonzalez was a plenary speaker on sexuality. Chicana Studies Policy workgroup formed. MALCS sponsored a meeting at NACS to discuss a Chicana Studies journal. Angie Chabran at UCLA and UC Davis members protested the depiction of Mexican women in a film by a UCLA student. 400 persons subscribe to MALCS Newsletter. 5th MALCS institute at UCLA. Organized by Angie Veyna, Chicana/Latina Studies, Office, Chicano Studies Research Center. Theme: Conflict and Contradiction. First conference outside of Northern California.